Gurinder Singh "Khalsa" along with Sikh Community of Fishers support TSA Employees with more than $6000 in gift card and food donations. 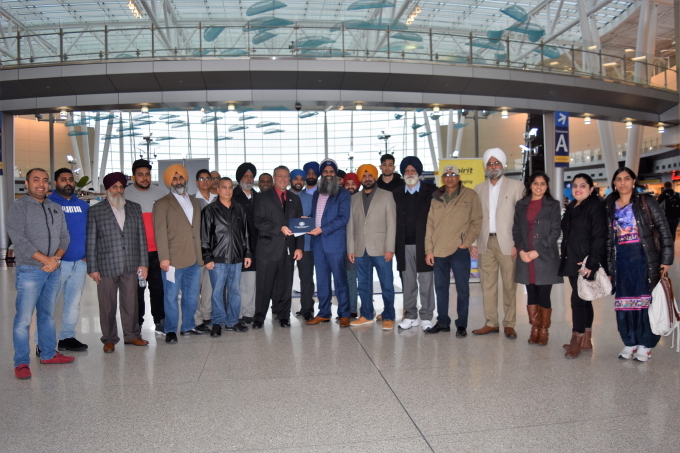 FISHER, Indiana - January 28, 2019: Gurinder Singh "Khalsa" along with the Sikh Community of Fishers, coordinated efforts with Mario Rodriguez, Executive Director of the Indianapolis Airport Authority and Aaron Batt, TSA Federal Security Director to support the Indianapolis Airport TSA agents who were impacted by the extended government shut-down. 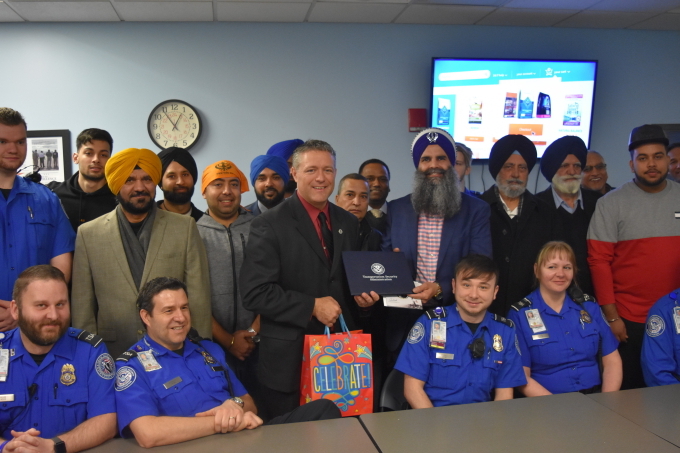 Over $6000 in gift/grocery cards, Indian hot food and pizza was served to TSA agents at the Indianapolis Airport on Monday, January 28, 2019, from 12:00 noon to 2:00 p.m.
"We are grateful for the support and selfless service of the Sikh community in Fishers," states Aaron Batt, Federal Security Director of the Indiana Transportation Security Administration. "The men and women at TSA have been in a very difficult situation, not knowing when they will be paid, but yet they have not allowed that uncertainty to get in the way of fulfilling our mission to protect the nation's transportation systems. 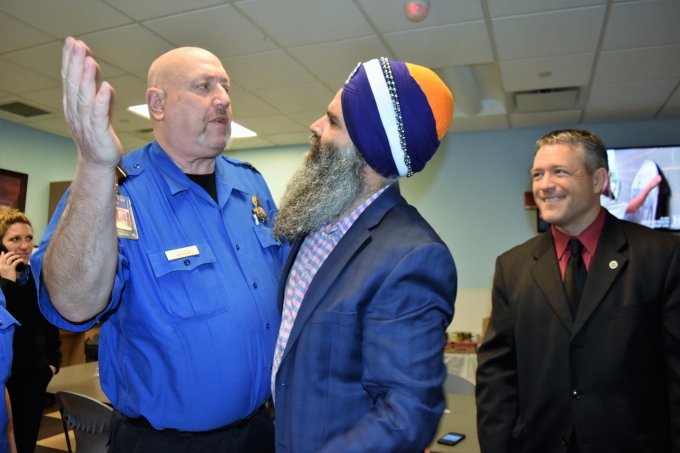 Their commitment and drive to protect the community is motivated when people like (Singh and the Sikh community) recognize their sacrifices and offer assistance." Batt presented Singh with the TSA Indiana Challenge Coin which recognizes those who exhibit core values of Integrity, Respect, and Commitment. One of the core principles of the Sikh community is selfless service to the needy by sharing our abundance with love and compassion. Even though the government is temporarily open for the next several weeks, the TSA employees have already gone without a paycheck for more than a month and will still be awaiting back pay," states Singh. "We need to put ourselves in their position and understand their struggles. 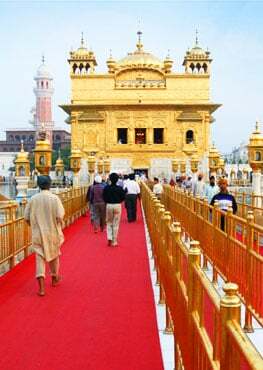 The Sikhs may be small in number, but are very fortunate. Each one of us needs to incorporate the American values we place in importance and step up do our part in selfless service to our neighbors in need. We hope this will inspire others to come forward for humanitarian causes."